www.ogauge.org - North Atlanta O-Gauge Railroad Club, the local club I belong to. An awesome bunch of guys! My YouTube Page - Lots of videos of my trains in action, O-scale tutorials, product revies and more. Piedmont Pilgrimage - The annual tour of Atlanta area train layouts. My layout is part of this tour. My Piedmont Pilgrimage Page - My page on the Piedmont Pilgrimage website. My Train Photos - Photos I've taken of real trains around Atlanta and other assorted places. More Of My Train Pics - My train photo album on the RailRoad Picture Archives website. Legacy Station- A great train store just outside of Atlanta owned by Brian Sheffield. Brian's a great guy and runs a great store. The Train Loft - Jeff Konczal's train shop in Winston-Salen, NC. Great store. The Train Doctor - A good place to buy replacement parts for postwar trains. Train Collectors Weekly - Train collectors weekly hall of fame. Millhouse River Studio - I bought my current turntable from Millhouse River. It's truly amazing! Brennan's Model Railroading - I buy many of my scenery supplies and kits from Dennis. Great guy! O-Gauge Railroading Magazine - O gauge railroading magazine. I'm an avid reader of OGR and their online forum is awesome as well. The Rise and Fall and Rise Again of Lionel Trains - A good article on the history of Lionel. Hobby Innovations - Makers of the wonderful Flexxbed roadbed material that I use on my layout. 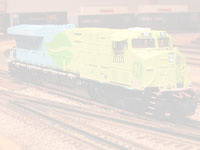 Lionel Trains - The official Lionel website. Atlas Trains - The home of Atlas, makers of some of the most detailed trains I've ever seen as well as great track. The Collectors Weekly Hall of Fame - My website was selected for The Collectors Weekly Hall of Fame. Read the article. Marty E's Kodiak Junction - Marty E.'s Kodiak Junction train website. www.ericsiegel.net - My biography, sorta.